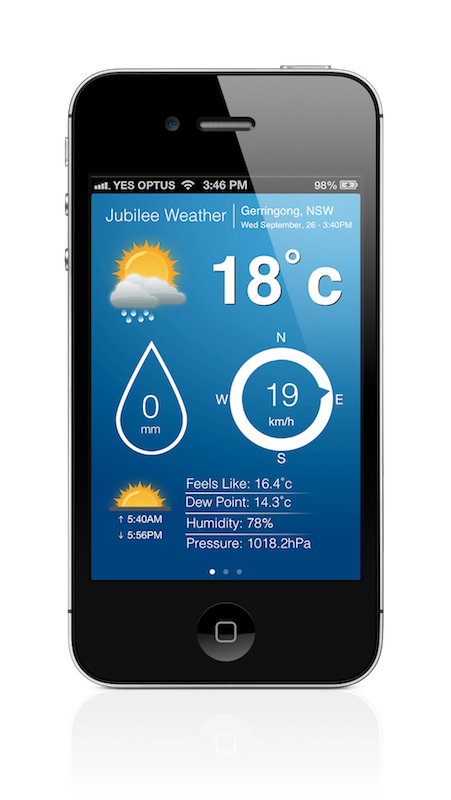 Jubilee Weather for iPhone offers a unique way to view weather data for Gerringong, NSW. Jubilee Weather is powered by a single Davis Vantage Vue station that provides updates of temperature, humidity, rainfall, windspeed, etc every 5 minutes (that's 5x more frequent than the Bureau of Meteorology) to ensure you get the very latest weather conditions and pack appropriately. All forecast data is provided by the Bureau of Meteorology. Unlike similar apps, we do not average two forecasts to try and be more accurate because we know that the average forecast is not what we get. The best part about Jubilee Weather is that us developers live in Gerringong, own and maintain the servers and weather station and use the app ourselves, if things go pear shaped we know and are on to the problem ASAP, no waiting for contractors or the Bureau of Meteorology to put out a fix. Contact us at app-support@jubileeweather.com if you have any issues or requests, we will attempt to answer all questions within 48 hours.